There were 131 species seen at the Festival this year. This list is on the Kachemak Bay Birders’ website http://kachemakbaybirders.org/. If there are other species that you are sure were seen during the Festival, please let me know. I did not get many reports of raptors and woodpeckers and some others possibly seen. A RED KNOT was seen at the end of the Spit by the Harbor and in Mud Bay on. RUFOUS HUMMINGBIRDS were seen on the 4th out East End Rd about 6 miles and then again at the Lighthouse Village Platform and in Beluga Slough the next day. A KING EIDER pair was seen off “the bluff” west of Homer on the 4th. Great photographs posted. A WESTERN WOOD-PEWEE was seen at the end of the FAA Rd. by the lower platform on the Lake on the 6th. RING-NECKED DUCKS, GADWALL, and CANVASBACKS were seen in Beluga Lake. A THAYER’S GULL was seen at the Lighthouse Village, Green Timbers and a few other places. Also an An ICELAND GULL was seen near Green Timbers on the 6th. GREAT BLUE HERONS were seen on the 4th near Bishop’s Beach. CASPIAN TERNS were seen on the 6th in Mud Bay. An OSPREY was seen near Beluga Slough/Bishop’s Beach before the Festival and again on the 7th. There was a report of BRISTLE-THIGHED CURLEWS at Anchor Point on the 6th but attempts to refind them were unsuccessful. Always nice during the Festival to have some swallows back, HERMIT THRUSH, ORANGE-CROWNED and YELLOW-RUMPED WARBLERS, terns, and TUFTED PUFFIN. And this year a hummingbird and a flycatcher, too! The Festival means many happy hours being out birding and enjoying the beauty and diversity of all those wonderful birds! It was a Great Festival to Bird (as our motto tells us)! Our weather has held with only a few sprinkles this afternoon. Hopes for no rain tomorrow here in Homer or out on the Bay. Fantastic birds and birding in various places today. This report will just cover the new species seen on Saturday and a few species of note from previous reports. Important news about the SANDHILL CRANE pair that has been hanging around that area. On Friday the pair was just walking around, but this morning they were actively taking grass to a nest site and one sat on the nest nearly the whole time we were there for the Viewing Station (11:30-1:00). For a few days many people also enjoyed watching them “paint” themselves, putting the red, iron-colored mud on their feathers to make them more camouflaged. CASPIAN TERNS were seen and the MARBLED GODWITS seen again. A couple ROCK SANDPIPERS were seen on the Harbor Jetty. These are the first ones seen even in shorebird monitoring for many weeks. Many hundreds/thousands overwinter here but usually are all gone by Festival time. BLACK OYSTERCATCHERS were seen on Hesketh Island. Another nice sunny day here in Homer! Many exciting new birds were found today: CANVASBACK and RING-NECKED DUCK in Beluga Lake this morning, TUFTED PUFFIN at Gull Island, and ALEUTIAN TERN at Green Timbers, and a THAYER’S GULL. 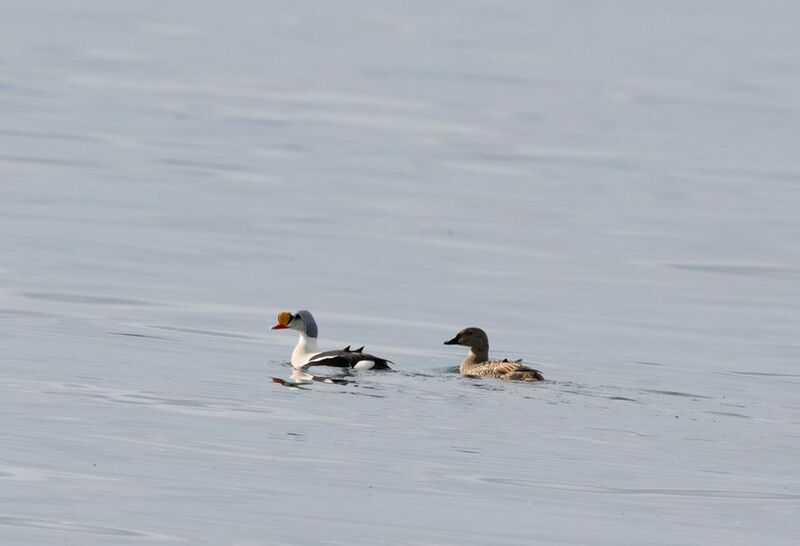 The KING EIDER from yesterday was confirmed with a beautiful photo, checkout our website if you haven’t seen it. It was a Great Day to Bird! Western Sandpiper/Dunlin/Least flock in Mud Bay was estimated to be ~4-5,000 today at 8:00 am; later estimate near noon was ~1500-2000. SEMIPALMATED SANDPIPER, MARBLED GODWIT, BAR-TAILED GODWIT, WHIMBREL, WESTERN SANDPIPERS, DUNLIN, LEAST SANDPIPER, SEMIPALMATED PLOVER, PACIFIC GOLDEN PLOVER, BLACK-BELLIED PLOVER, SHORT-BILLED DOWITCHER, BONAPARTE’S GULL, BRANT, GREATER YELLOWLEGS, NORTHERN PINTAIL, GREATER SCAUP, HORNED GREBE, BLACK-LEGGED KITTIWAKE, MEW GULL, HERRING GULL, GLAUCOUS GULL, SAVANNAH SPARROW, AMERICAN WIGEON, MALLARD, NORTHERN SHOVELER, GREEN-WINGED TEAL. ORANGE-CROWNED WARBLER, GOLDEN-CROWNED SPARROW, FOX SPARROW, GREATER YELLOWLEGS, LEAST SANDPIPER, WESTERN SANDPIPERS, DUNLIN, GREEN-WINGED TEAL, AMERICAN WIDGEON, NORTHERN PINTAILS, MALLARDS, SANDHILL CRANES. LONG-TAILED DUCK, RED-THROATED LOON, NORTHERN SHOVELER, BONAPARTE’S GULL, COMMON REDPOLL, SEMIPALMATED PLOVER, PACIFIC GOLDEN PLOVER, BLACK-BELLIED PLOVER,WHIMBREL, SURFBIRDS, BLACK TURNSTONE, LEAST SANDPIPER, SEMIPALMATED SANDPIPER, DUNLIN, DOWITCHER (sp), BRANT, WESTERN SANDPIPERS, BLACK-BELLIED PLOVER, LEAST SANDPIPER, ARCTIC TERN, AMERICAN PIPIT, SAVANNAH SPARROW, FOX SPARROW, SONG SPARROW. TUFTED PUFFIN on Gull Island, SURFBIRDS, BLACK TURNSTONES, HORNED GREBE, SCOTERS (WHITE-WINGED, SURF, BLACK), RED-NECKED PHALLAROPE, PIGEON GUILLEMOT, COMMON MURRES, HARLEQUIN DUCKS, LONG-TAILED DUCK, COMMON LOON, PACIFIC LOONPELAGIC CORMORANT, BLACK-LEGGED KITTIWAKES. ORANGE-CROWNED WARBLER, FOX SPARROW, AMERICAN ROBIN, AMERICAN WIGEON, NORTHERN PINTAIL, WESTERN SANDPIPER, NORTHERN SOVELER, BALD EAGLE, BLACK-BILLED MAGPIE, NORTHWESTERN CROW, GOLDEN-CROWNED SPARROW, SANDHILL CRANE. TRUMPETER SWAN pair, GREATER WHITE-FRONTED GEESE, CACKLING GEESE, CANADA GEESE, RED-NECKED GREBE, BUFFLEHEAD, MALLARD, GREEN-WINGED TEAL, NORTHERN PINTAIL, RING-NECKED DUCK, CANVASBACK, NORTHERN SHOVELER, AMERICAN WIGEON, GREATER SCAUP, WILSON’S SNIPE, RED-NECKED PHALAROPE and LEAST SANDPIPER (both flying), MEW GULL, SANDHILL CRANE (heard) NORTHERN HARRIER, BALD EAGLE, BLACK-BILLED MAGPIE, BOREAL CHICKADEE, RUBY-CROWNED KINGLET, GOLDEN-CROWNED KINGLET, AMERICAN ROBIN, VARIED THRUSH, AMERICAN PIPIT, WHITE-WINGED CROSSBILL, DARK-EYTED JUNCO, LINCOLN’S SPARROW, BROWN CREEPER, GOLDEN-CROWNED SPARROW, COMMON RAVEN, GREATER YELLOWLEGS. BROWN CREEPER, PINE GROSSBEAK, GOLDEN-CROWNED KINGLET, NORTHERN GOSHAWK, RED-BREASTED NUTHATCH, AMERICAN ROBIN, VARIED THRUSH,. HARLEQUIN DUCK, WHITE-WINGED SCOTER, LONG-TAILED DUCK, COMMON MERGANSER, RED-BREASTED MERGANSER, PACIFIC LOON, RED-NECKED GREBE, DOUBLE-CRESTED CORMORANT,BALD EAGLE, BLACK-BELLIED PLOVER, WHIMBREL, RUDDY TURNSTONE, DUNLIN, MARBLED MURRELET, NORTHWESTERN CROW, AMERICAN WIGEON, MALLARD, GREATER SCAUP, SURF SCOTER, COMMON LOON, PELAGIC CORMORANT, SANDHILL CRANE, PACIFIC GOLDEN-PLOVER, SEMIPALMATED PLOVER, BLACK TURNSTONE, LEAST SANDPIPER, COMMON MURRE, PIGEON GUILLEMOT, BLACK-LEGGED KITTIWAKE, MEW GULL, GLAUCOUS-WINGED GULL, BELTED KINGFISHER, BLACK-BILLED MAGPIE, AMERICAN PIPIT, LAPLAND LONGSPUR, FOX SPARROW, SAVANNAH SPARROW. Nice sunny day and not even much breeze until noontime. Many good birds (of course they’re all good birds) and many happy birders at our Festival. Estimated Western Sandpiper/Dunlin flock in Mud Bay estimated to be ~1500 today. A RUFOUS HUMMINGBIRD was reported out East End Rd., with photos! GREAT BLUE HERON in town near Bishop’s Beach on Jenny Way. Unconfirmed report of a KING EIDER seen from a boat off “The Bluff” west of town, but unconfirmed at this time. SURFBIRDS, MARBLED GODWIT, BAR-TAILED GODWIT, WHIMBREL, WESTERN SANDPIPERS, DUNLIN, SEMIPALMATED PLOVER, PACIFIC GOLDEN PLOVER, BLACK-BELLIED PLOVER, SHORT-BILLED DOWITCHER, BONAPARTE’S GULL, BRANT, GREATER YELLOWLEGS, LEAST SANDPIPER. GREATER WHITE-FRONTED GEESE, SEMIPALMATED SANDPIPER, GOLDEN-CROWNED SPARROW, FOX SPARROW, RED-BREASTED NUTHATCH, SEMIPALMATED PLOVER, GREATER YELLOWLEGS, LEAST SANDPIPER, VIOLET-GREEN SWALLOWS, GREEN-WINGED TEAL, AMERICAN WIDGEON, NORTHERN PINTAILS, MALLARDS. COMMON EIDER and KITTLITZ’S MURRELET (scoped to the west), RED-THROATED LOON, NORTHERN SHOVELER, BONAPARTE’S GULL, COMMON REDPOLL, SEMIPALMATED PLOVER, PACIFIC GOLDEN PLOVER, BLACK-BELLIED PLOVER,WHIMBREL, SURFBIRDS, BLACK TURNSTONE, LEAST SANDPIPER, SEMIPALMATED SANDPIPER, DUNLIN, DOWITCHER (sp), BRANT, WESTERN SANDPIPERS, BLACK-BELLIED PLOVER, LEAST SANDPIPER, ARCTIC TERN, AMERICAN PIPIT, SAVANNAH SPARROW, FOX SPARROW, SONG SPARROW. PEREGRINE FALCON, SURFBIRDS (150 on Harbor Jetty with Turnstones), RUDDY TURNSTONES, BLACK TURNSTONES, WESTERN SANDPIPERS, WANDERING TATTLERS (in Harbor), SONG SPARROWS, SAVANNAH SPARROWS, ROCK PIGEONS, NORTHWESTERN CROWS. SURFBIRDS (800), BLACK TURNSTONES, HORNED GREBE, SCOTERS (WHITE-WINGED, SURF, BLACK) RED-NECKED PHALLAROPE (200), PIGEON GUILLEMOT, COMMON MURRES (most in breeding plumage), HARLEQUIN DUCKS, LONG-TAILED DUCK, COMMON LOON, PELAGIC CORMORANT, BLACK-LEGGED KITTIWAKES. Reports of 5-8 BALD EAGLES on Gull Island, another of 15 in the area! BELTED KINGFISHER, GREATER YELLOWLEGS, WESTERN SANDPIPERS, DUNLIN, SEMIPALMATED PLOVER, SHORT-BILLED DOWITCHERS (sp. ), GREATER WHITE-FRONTED GEESE, CACKLING GEESE, VIOLET-GREEN SWALLOWS, AMERICAN WIGEON, GREEN-WINGED TEAL. TRUMPETER SWAN pair apparently nesting across the water, RUBY-CROWNED KINGLETS and DARK-EYED JUNCOS singing away, also PACIFIC WRENS, GOLDEN-CROWNED KINGLETS in the area. VARIED THRUSH, WILSON’S SNIPE. YELLOW-RUMPED WARBLER at Seaside Farms. RING-NECKED PHEASANT nearby. SNOW GEESE (3), CACKLING GEESE, PACIFIC GOLDEN PLOVER, BELTED KINGFISHER, DUNLIN, BLACK-BELLIED PLOVER, WHIMBREL, GREATER YELLOWLEGS, RUDDY TURNSTONE, BLACK TURNSTONE, SHORT-BILLED DOWITCHER, LEAST SANDPIPER, WESTERN SANDPIPER, ARCTIC TERN, VIOLET-GREEN SWALLOW. Pair of GREAT BLUE HERON in Beluga Slough (reported this evening). YELLOW-RUMPED WARBLERS at Seaside Farms (5 miles out East End Rd.). Omitted earlier but seen on Wednesday: LAPLAND LONGSPUR (3) at Green Timbers. Also don’t forget to report crane sightings and their nesting activities to reports@cranewatch.org or call 907-235-6262. Be sure to include your own contact information in case they need additional information. A strong wind blew late yesterday and that was what it took to blow us in a super great group of species just in time for our Shorebird Festival which is starting! 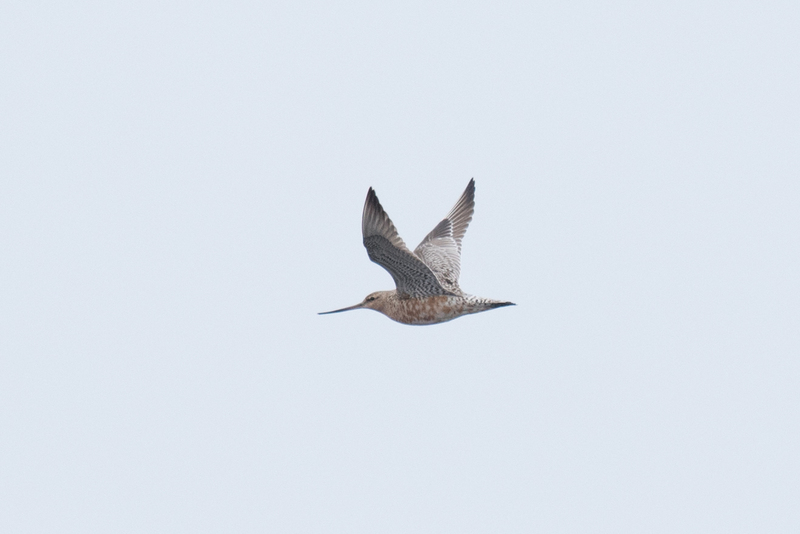 Fantastic to spot a BAR-TAILED GODWIT flying over Green Timbers this morning and find a MARBLED GODWIT in Mud Bay. Probable FOS: LONG-BILLED DOWITCHER, SEMIPALMATED SANDPIPER, WANDERING TATTLER, and OSPREY! George Matz will post an in-depth account of the shorebird monitoring this morning, but some of the highlights are below. WESTERN SANDPIPER (~1000), DUNLIN, SEMIPALMATED PLOVER, PACIFIC GOLDEN PLOVER, BLACK-BELLIED PLOVER, MARBLED GODWIT, WHIMBREL, SHORT-BILLED DOWITCHER, BONAPARTE’S GULL, GLAUCOUS GULL (im. ), BRANT, GREATER YELLOWLEGS, LEAST SANDPIPER. SEMIPALMATED PLOVER, GREATER YELLOWLEGS, LEAST SANDPIPER, VIOLET-GREEN SWALLOWS. BAR-TAILED GODWIT (flyover), LONG-BILLED DOWITCHER, WHIMBREL, DUNLIN, WESTERN SANDPIPERS, BLACK-BELLIED PLOVER, LEAST SANDPIPER, SEMIPALMATED PLOVER, PEREGRINE FALCON, SAVANNAH SPARROW, AMERICAN PIPIT, LAPLAND LONGSPUR, ARCTIC TERN, RED-THROATED LOON (one group of 7; total 14 seen!). SEMIPALMATED PLOVER, PACIFIC GOLDEN PLOVER, WHIMBREL, SURFBIRDS (~350), BLACK TURNSTONE, LEAST SANDPIPER, SEMIPALMATED SANDPIPER, DUNLIN, DOWITCHER, BRANT. SURFBIRDS (~300 probably same group as in Louie’s), RUDDY TURNSTONES, BLACK TURNSTONES, WESTERN SANDPIPERS, WANDERING TATTLERS (in Harbor). DUNLIN, BLACK-BELLIED PLOVER, WHIMBREL, GREATER YELLOWLEGS, RUDDY TURNSTONE, BLACK TURNSTONE, SHORT-BILLED DOWITCHER, LEAST SANDPIPER, WESTERN SANDPIPER, ARCTIC TERN, VIOLET-GREEN SWALLOW. TRUMPETER SWAN pair apparently nesting across the water, RUBY-CROWNED KINGLETS and DARK-EYED JUNCOS singing away, also PACIFIC WRENS, GOLDEN-CROWNED KINGLETS in the area. Over the weekend the following were seen: SHARP-SHINNED HAWK and ROUGH-LEGGED HAWK (~Mile 3), NORTHERN HARRIER (~Mile 5). Songbirds singing and building nests at Seaside Farms and elsewhere. GOLDEN-CROWNED SPARROWS and FOX SPARROWS singing; SAVANNAH SPARROWS not singing yet. In the past few weeks, groups of SANDHILL CRANES have been seen on the beach just east of Miller’s Landing, in the evening mid-tide. Often they don’t feed there until the fall but speculation that maybe there was less food up higher? A large group of 150 was seen out in the Fernwood Rd area, (~7 miles out). George Matz has prepared a spreadsheet containing the results of the 2016 shorebird monitoring project. The 2016 Kachemak Bay Shorebird Festival took place May 12-15. The attached checklist shows the species seen during the festival- 140 species were seen over the four festival days. This list has been compiled from the Checklist of Birds of Kachemak Bay (April 2002) with some revisions (April 2005). Like the original checklist, it covers the Anchor River drainage, the watersheds draining into Kachemak Bay including Kachemak Bay State Park and the Bay itself between Anchor Point and Point Pogibshi. It features species and their historical likelihood of occurrence in the spring only, i.e., those birds likely to be seen during the Kachemak Bay Shorebird Festival, which has taken place on the first or second weekend of May since 1993. Starting time is based on the quarter hour before the receding tide reaches 15.0 feet, or high tide if it doesn’t reach 15.0 feet using Seldovia tide tables. The tide correction between Seldovia and Homer is only +5 minutes. Monitoring lasts for two hours. Monitoring is based on when the incoming tide is about half way between low tide and high tide. This corresponds to beginning an hour before the tide at the Kenai River. Entrance is at +10.0 feet. Monitoring last one and a half hours. The final version of the 2015 Kachemak Bay Shorebird Monitoring Project report has been completed by George Matz. The report can be downloaded by clicking the file link below.